This is a pattern one can trace right through the Old Testament. Whenever God’s people were obedient and faithful to the Lord, He blessed them with possessions, abundant rain, military victory and prosperity. When they were disobedient and unfaithful, they would experience drought and famine. Consistently the good kings of Israel and Judah were prosperous, while the bad kings plunged the nation into poverty and captivity. Today many Christians feel that they can claim the same principle of prosperity and blessing. And they are right. God wants to bless and prosper us. He wants us to have His very best and to have abundance. Those believers who are faithful to the Lord and obedient to His Word are blessed with an abundance of riches, prosperity, victory and blessing. While those who walk in disobedience suffer poverty, defeat and the Lord’s discipline. But, there is one big difference between the physical, literal descendants of Abraham (Old Testament Israel) and the spiritual descendants of Abraham (the Church). They were physical descendants and we are spiritual descendants (Romans 2:28-29; 4:16-17). The one is tangible, while the other is not. One can be seen and the other not. To the physical descendants of Abraham, God gave physical promises of blessing, but also of judgment and cursing. To us, who are spiritual sons, the promises are no longer physical but spiritual. Thus, physical promises and blessings are to physical descendants, and spiritual promises and blessings are to spiritual descendants. It is right to speak about blessings and prosperity for Christians, but these are spiritual blessings, victories, harvests and fertility. Yes, the Lord wants us to be rich – not rich with money but rich with spiritual wealth. He wants us to be prosperous and to extend our borders – not of lands but of knowledge of His Word. It is God’s will for us to have many children – spiritual sons that have been born of the Spirit. (I have always been amazed that those who preach a physical prosperity never speak about the fact that part of the promises of the Old Testament including having many children!) Yes, He wants us to be victorious, not over the heathen nations, but in spiritual battles with the enemy of our souls and in our circumstances. The Lord certainly wants us to reap abundant harvests – not of wheat and barley, but of souls. There is an abundant inheritance for us – not in this world, but in that which is to come. Sometimes we feel guilty to speak of these wonderful spiritual blessings because the money preachers have so perverted the Word. In fact, we have not only ignored but become suspicious of many of the Scriptures that speak of God’s blessings. In the process we have turned our backs on a very wonderful part of the Bible: that the Lord does want to bless us, and that His intentions toward us are only good: “He who did not spare His own Son, but delivered Him up for us all, how shall He not with Him also freely give us all things?” (Romans 8:32). We must not overreact to the heresy of our age by ignoring some of the very important teachings of the New Testament. To do so robs us of our inheritance. One of the most significant messages Jesus preached is called “the Sermon on the Mount” (Matthew chapters 5 through 7). In his opening thoughts He used the word “blessed” nine times. The same word appears at least 55 times in the New Testament. Blessed means happy, blessed by God, and in a state of wellbeing which is to be desired. 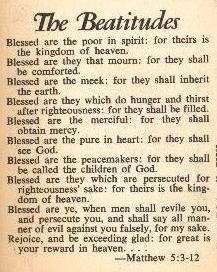 In these verses Jesus clearly teaches that He wants us to be blessed, but not in a worldly sense (Read Matthew 5:3-12 for yourself). The Lord wants us to have more than just enough. He wants us to have abundance and to treasure up the extra. In the Sermon on the Mount Jesus said: “Do not lay up for yourselves treasures on earth, where moth and rust destroy and where thieves break in and steal; but lay up for yourselves treasures in heaven, where neither moth nor rust destroys and where thieves do not break in and steal. 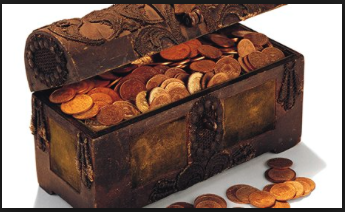 For where your treasure is, there your heart will be also” (Matthew 6:19-21). It is not God’s will that Christians be spiritual paupers who barely have enough spiritual food for themselves. No. He wants us to have superabundance so that we will be able to share with others, and so that we will be able to break down our barns to build bigger ones to contain all of His blessings in our lives. Sadly, however, we spend so much time trying to amass earthly treasure that we never seem to bother to find the true riches. Also, if we set about searching for God’s blessings without seeking Him we will come away disappointed. For example, all the bad Kings of Israel chased after money, power and influence, and, in the process, forsook the Lord. Needless to say, they all came short. The few good ones who sought the Lord and His will first received God’s blessings. Hezekiah set out on the first day of his reign to seek the Lord and His honor. As a result the Lord blessed him and gave him everything else as a bonus. I often come across Christians who consume many Christian things like books, DVD’s, preachers and churches. They are chasing after spiritual blessing, and that seems good. Yet they are spiritually bankrupt. Why? Because they want the gifts, but not the Giver. They want the blessings, and not the One who blesses. Moreover, they want the blessings on their terms, on their time, and not the Lord’s. So, don’t chase after the blessings – chase after the Lord. Don’t long for more blessings, but hunger for more of Him. It is my desire and prayer for you that you will live a life of abundance. I pray that “all these blessings shall come upon you and overtake you” (Deuteronomy 28:2), and that “The Lord will open to you His good treasure, the heavens, to give the rain to your land in its season, and to bless all the work of your hand. (That) You shall lend to many nations, but you shall not borrow. And (That) the Lord will make you the head and not the tail; you shall be above only, and not be beneath” (Deuteronomy 28:12-13). I pray that as the Lord’s people we will truly know Him, and know His abundance in our lives. 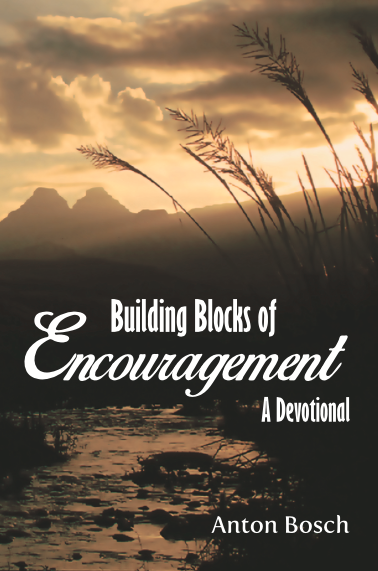 *What you have just read is an excerpt from Anton Bosch’s soon to be released book Building Blocks of Encouragement – A Devotional. The book is a selection of 60 of his most popular articles written over the past 11 years. As the title suggests, the articles are encouraging and edifying. Each chapter is free standing and is designed to be easily read in one sitting. In addition to being encouraging, the articles are doctrinally orthodox and the book is therefore a safe gift for friends and family that will bless strengthen and encourage. To pre-order the book, contact the Discernment Ministries Book Center (903) 567-6423.